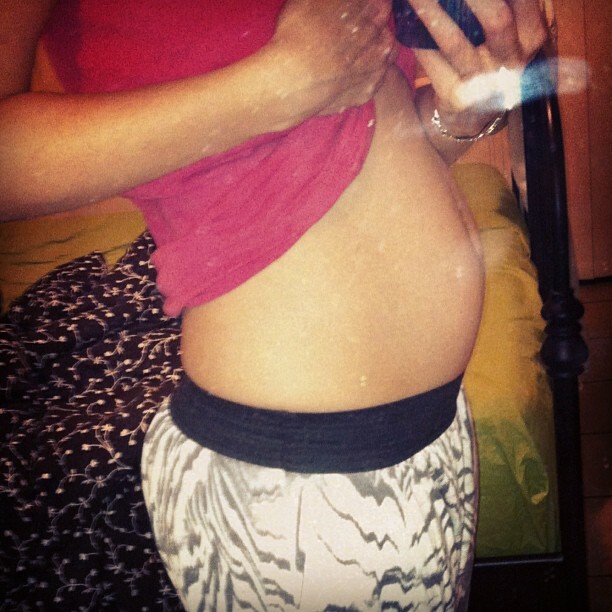 I finally look pregnant, yay! One day I woke up and the bump had grown massively overnight. Of course it doesn't look that big in photos, just to piss me off. A lovely lady at lufflump's daycare noticed I was pregnant which is a first. I was pretty chuffed. It is becoming harder to hide the bump. Unfortunately it's also harder to hide the growing muffin top. I'm thankful my thunder thighs haven't joined the growing trend so I can still wear my jeans and shorts. I did get my 'maternity' wear out of storage. I use that term lightly as it's mainly wrap around or elastic wasted skirts, and dresses. It's my maternity wear though that I'd stored as we didn't expect to have another baby so soon. I've booked in for my 19 week scan and we are hopefully finding out what gender sesame is. Hopefully sesame will be like lufflump and spread eagle for all to see. I've also got an appointment with the antenatal mental health nurse at the hospital and my 20 week first birth centre appointment. It's all happening! Sesame has been very active especially near my bladder. I don't remember needing to pee this often when I was pregnant with lufflump. I was living on a mango farm back then though so who knows, it's a blurry time. I don't think I'm having any major cravings although most days I feel like a KFC Original Fillet Burger and that's pretty gross. I'm also really into savory foods rather than sweet. In fact, I think I've eaten less chocolate during this pregnancy than I ever have. Strangely satisfying still. Here's this week's belly shots! These pants are too small now too. Mega sadface. I love how you show off your gorgeous teeny baby belly with such pride...as you should! 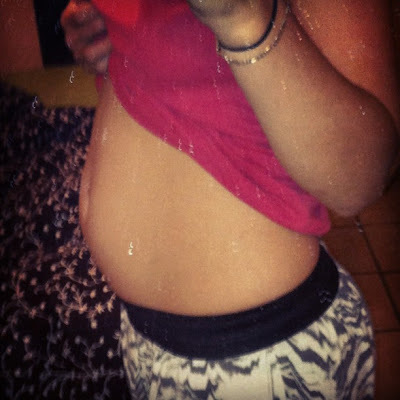 isn't it just lovely when you finally have a bump? Hope all the appointments go well for you, sounds like a super busy time at your place. Yay, how exciting. Cant wait to hear what you are having. love the baby tummy Amy! How exciting! Are you going to share whether Sesame is a boy or girl? Or find out and keep the rest of us guessing? You have a beautiful baby belly, Ames! So exciting when its obvious enough for people to be able to tell without assuming you just ate too make KFC original fillet burgers. Good luck! Hope the baby is spread eagle letting the world see! Great looking baby bump! I've always had the opposite problem of looking about 30 weeks pregnant at about 15 weeks *sigh*. Enjoy the next 20+ weeks! Oh it's so cute! I'm glad people are noticing. I think I offended a friend the other day by saying she is barely showing when she thinks she is. Oops! I meant it as a compliment! In the flip side there is a bigger lady at playgroup who o's looking suspiciously round, but I'm too scared to ask!